The book tells the story of the Endurance, which became trapped in the Wendell Sea. 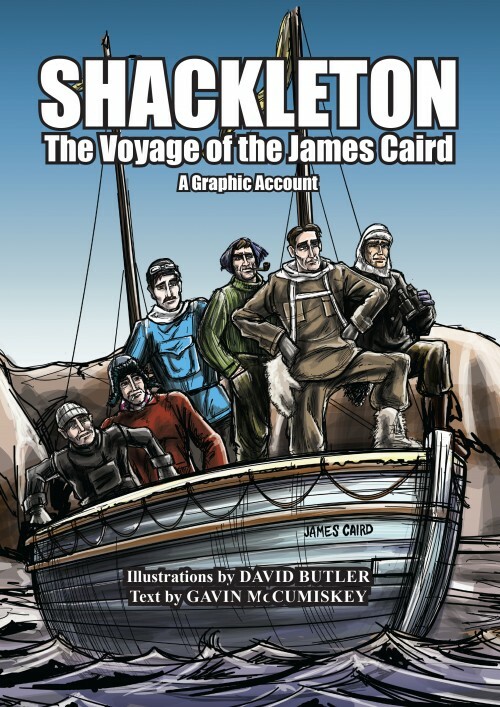 Shackleton must then fight to save the twenty-seven that set sail with him. This leads to Shackleton and five others taking to sea in the lifeboat James Caird and setting out for Georgia, 800 miles across the treacherous and icy sea. The writing provides a good amount of information without being an information dump. Considering that the book is based on historical events, with probably a lot of source material available, McCumiskey provides a good narrative while keeping the story relatively lean information-wise. The dialogue helps move the story along. The story could have easily been a very dry read, but the personable dialogue makes sure that it isn’t. Lettering in the book is well done by Coleman throughout the book. It’s clear and easy to follow with good placement above the artwork. Also, the captions have a nice effect rendered on them to give the appearance of aged paper. The art is well executed. The layouts make it easy for the reader to follow the story through each page. It displays a good understanding of the medium. The colours were a nice surprise too. Given that the story takes place in Antarctica and the surrounding waters, I wasn’t expecting the variety of colours that were used in the artwork. Some good choices of colours to give the art a sense of energy where it could have ended up being very muted or dull. There were one or two panels, and it was literally that few, where I had to work to figure out what was happening in the panel. I think this was down to the lack of contrast in the panels. It wasn’t easy to decipher what was background and what was the object of focus in the panels. A small complaint considering the rest of the book had no such problem. I came to this book hoping to learn something about Shackleton and to also enjoy a good comic book. I’m happy to say that the team behind the book delivered on both counts. A good comic to pick up if you want a good introduction to the story of Shackleton and the voyage of the James Caird.